My great-great grandfather was born in Ireland, but that was only because that was where the boat happened to be docked when his Danish parents were on their way to America and Mama Davison went into labor. From there he made his way to California, where he enlisted in the Union Army at a very small town called Volcano and later became the first mayor of Chico. I think he may be the gentleman in the second row standing behind the severe-looking woman with the white cap. Or maybe not. At least, that was the story I grew up with. It turned out to be only partly true, as I discovered recently when I did a little online research and found he had his own Wikipedia page and was also given space in an 1891 volume called A Memorial and Biographical History of Northern California. Who knew? Not me, that’s for sure. He certainly set the bar high for his family, and I think I can safely say without fear of contradiction that most of his descendants never bothered to try to equal his accomplishments and good works. Underachievers R Us. St. Patrick’s Day came by about a week ago. I made the standard American tribute to Irish food, corned beef and cabbage (which I believe is unknown in Ireland, but never mind). We had guests for dinner and I had planned to make Nigella Lawson’s Guinness Cake until I read the recipe and realized it was basically a chocolate cake: one of our guests is not a chocolate fan. I figured that someone out there on the internet had devised a recipe for a Guinness cake sans chocolate, and sure enough, I found one on A Beautiful Plate. Use a REALLY big pan to boil the Guinness and molasses together because when you add the baking soda, you will create your very own Hiroshima in the kitchen and trust me, you do not want to have to clean that up. I used a microplane to grate the fresh ginger, and it takes a rather large piece of ginger to yield 1 tablespoon grated ginger. Don’t omit it: it really oomphs up the cake flavor. Spray the inside of the measuring cup with nonstick spray before measuring the molasses: it will pour out much more easily. I can’t think of anything that replicates the blackness, dark mineral taste, and satiny texture of Guinness. I suppose if you really had to, you could substitute very, very dark espresso coffee, but then you couldn’t really call it Guinness Cake, could you? Slightly adapted from the original. This is best the day it’s made, but will keep for one or two more days. Preheat oven to 350 Fahrenheit. 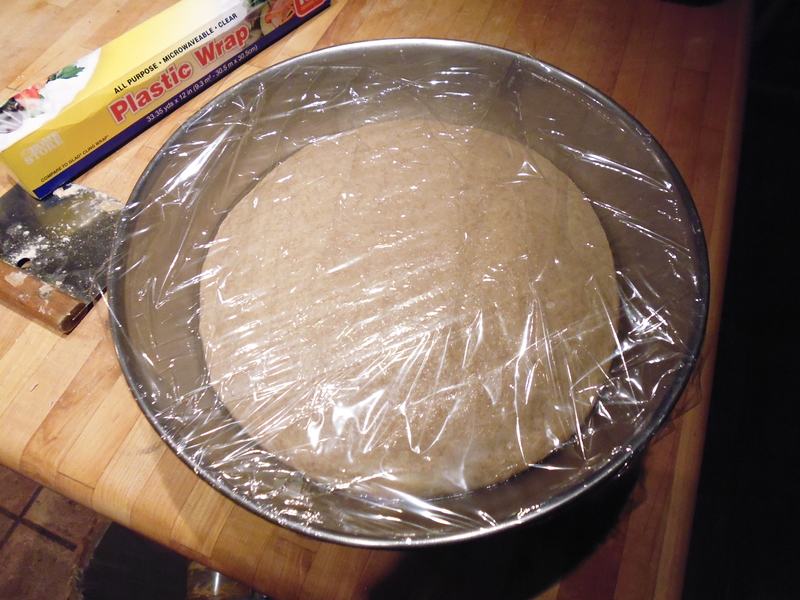 Grease two 9″ cake pans (or spray with cooking/baking spray or a product like Baker’s Joy) . 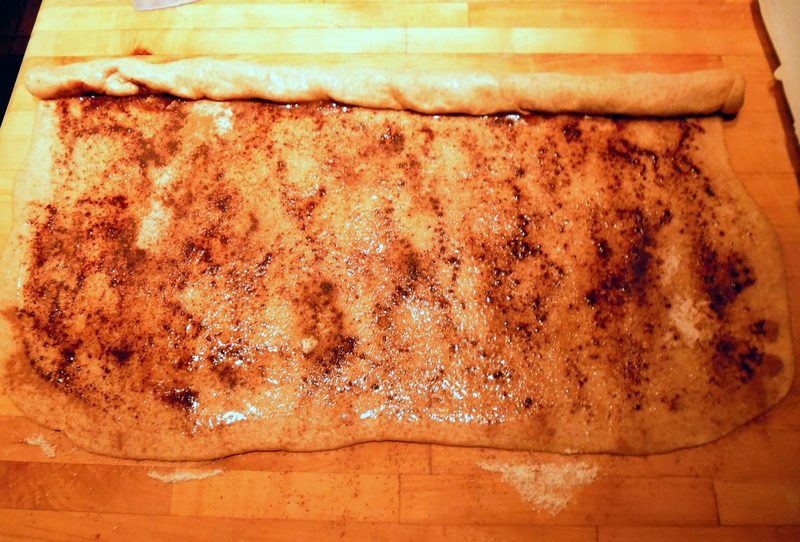 Line them with parchment paper and grease or spray them again. 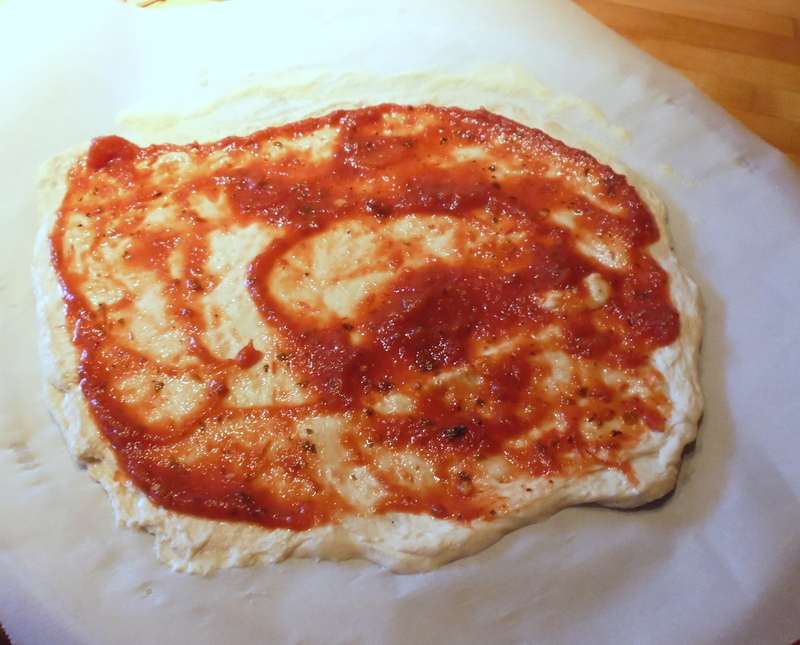 Here I pieced parchment paper together to fit the pans, which works just fine. Pop open your Guinness. Measure out one cup and either drink the rest or recap with a cork. For God’s sake, don’t waste it. Combine the Guinness and the molasses in that really big pan, whisk together, and bring to a boil over medium-high heat. It will start to foam up. This is not the time to walk away to answer the phone. Remove from the stove and whisk in the baking soda. It will foam way, way up. This is why you need a large pan. Let it sit and cool for about 10-15 minutes, stirring occasionally. Beat together the eggs with the granulated sugar and brown sugar, being careful to either dissolve or remove any teeny hard lumps of brown sugar. Then whisk in the oil, which will try to resist being incorporated with the eggs. In a large-ish bowl, combine the flour, baking powder, and all the ground spices, plus the grated ginger. Slowly pour the Guinness-molasses mixture into the egg-sugar-oil mixture. You do not want to pour it all at once: slowly pour in about 1/3 cup and then whisk it into the eggs thoroughly. Again, slowly add about 1/3 cup more and whisk again. Keep adding and whisking until all liquids are combined. This is so you do not heat the eggs too fast and risk scrambling them – they need to be heated (“tempered”) slowly. Once that’s all done, pour half of the liquid into the flour mixture and combine with a spoon. Then pour in the other half and mix until just combined and there are no pockets of flour in the batter. Scrape half of the batter into each prepared cake pan. 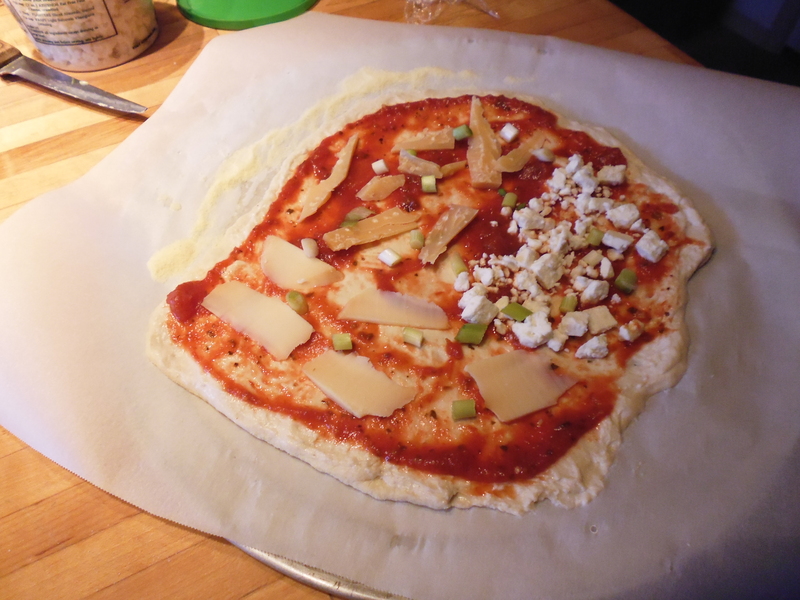 Bake about 28 to 35 minutes. Do not open the oven door until 28 minutes has passed; this cake has a tendency to fall in the middle. Close the oven door carefully. When the cake is done, it will spring back when touched lightly. Remove cakes to cooling rack for about 15 minutes. Remove cakes from pan. 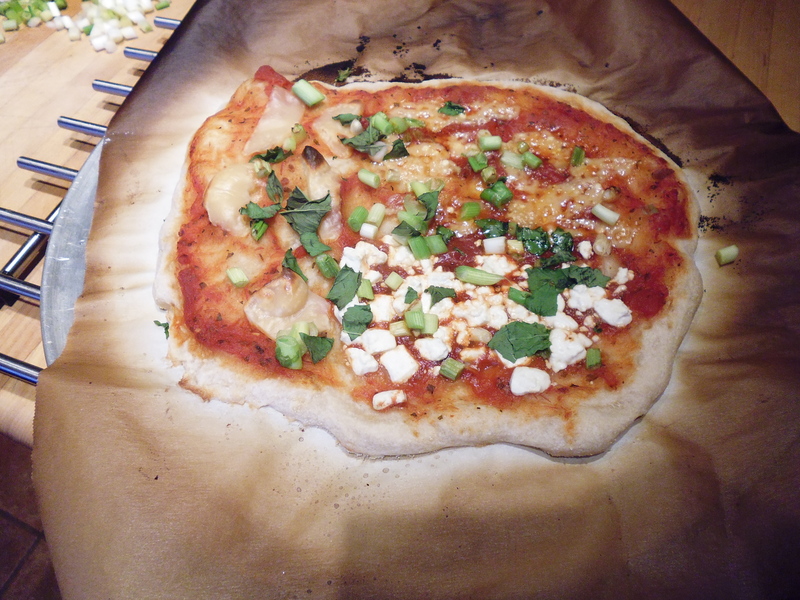 Invert each one carefully onto your hand or a plate and peel off the parchment paper. Re-invert and let cool completely on the rack. The original recipe suggested a Bailey’s Irish Cream frosting, and you can do that if you want, but I personally can’t see whatever it is people seem to like about Bailey’s. It’s just a big bleah nondescript sweet creamy liqueur to me. 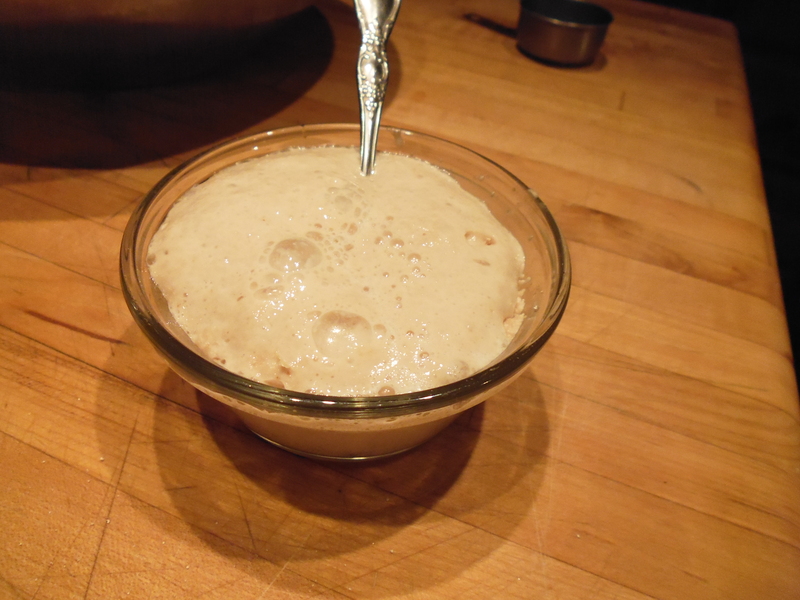 I made a Jack Daniel’s frosting instead; cognac, rum, or other booze would work too. Or just flavor frosting with vanilla or almond extract. Combine softened butter and cream cheese, then mash in the powdered sugar (this takes patience and it looks like it won’t work, but go slowly and keep mashing the sugar into the cream cheese & butter) . Then add salt, vanilla, and whiskey; stir until combined. Taste and add more sugar or whiskey as you prefer. If this seems a little liquid-y, store in the refrigerator until ready to frost the cake. This makes enough to frost tops of each layer. You can, of course, make more frosting to cover the entire cake, but I loved the look of the nearly-black cake with the white frosting. Let sit, covered, a couple of hours before slicing and serving. A few strawberries and perhaps a big pillow of sweetened whipped cream would go well with this. Posted in recipe, Uncategorized and tagged baking, cake, dessert, Guinness, technique, vegetarian. Bookmark the permalink. My husband was badgering me to make cinnamon rolls and actually, that sounded like a pretty good idea. But I have tried recipes that did not turn out well before, so I was reluctant to put the time and effort in for nothing. 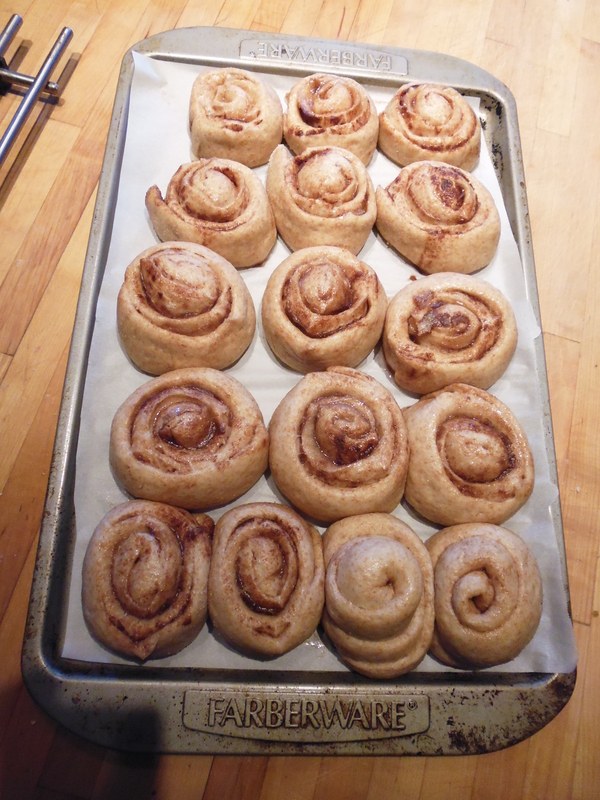 Finally I put my trust in Jane and Michael Stern’s Coast-to-Coast Cookbook: Real American Food and tried Mary’s Cafe Cinnamon Rolls recipe (Mary’s Cafe in Casey, Iowa). They were sublime. I substituted butter for lard, but otherwise I pretty much followed the recipe. Scald the milk with the butter, salt, and sugar. (That means heat them together until bubbles appear around the edge of the pan. 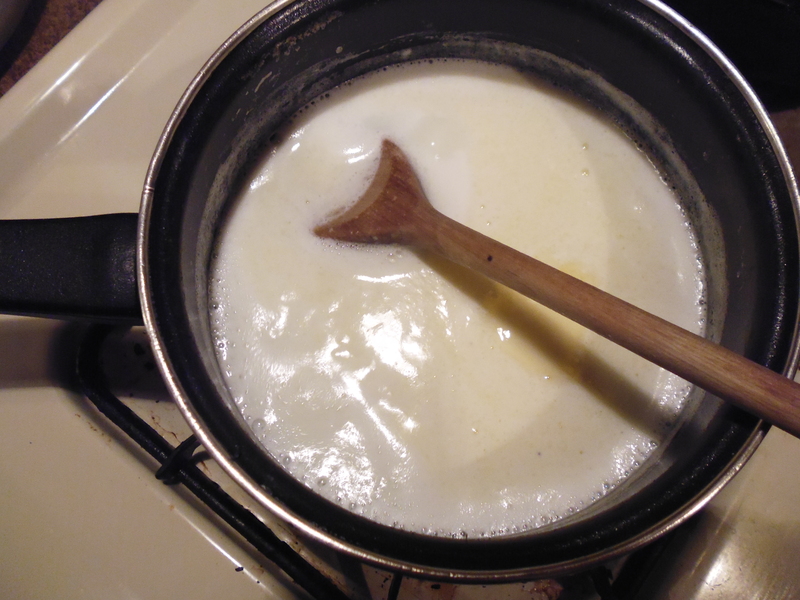 Stir occasionally so the sugar dissolves and doesn’t stick to the bottom of the pan. ) Let cool to tepid, then mix in the egg and vanilla. Proof the yeast in the water and sugar. 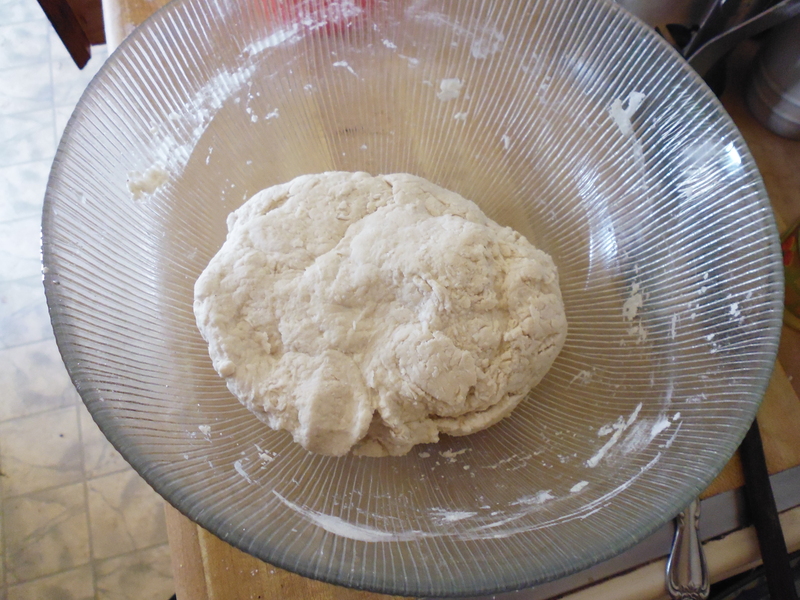 Measure three cups flour into a bowl. 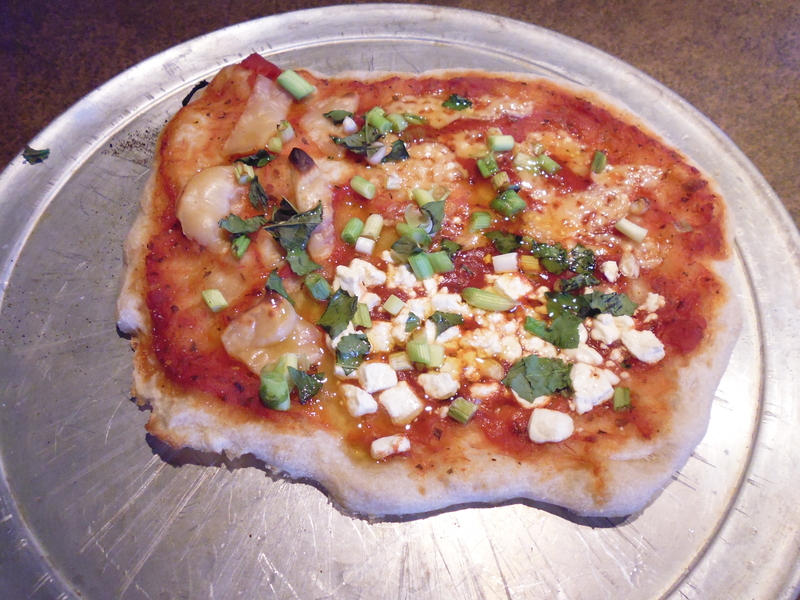 (I used half unbleached and half whole wheat, but use all unbleached if you like.) 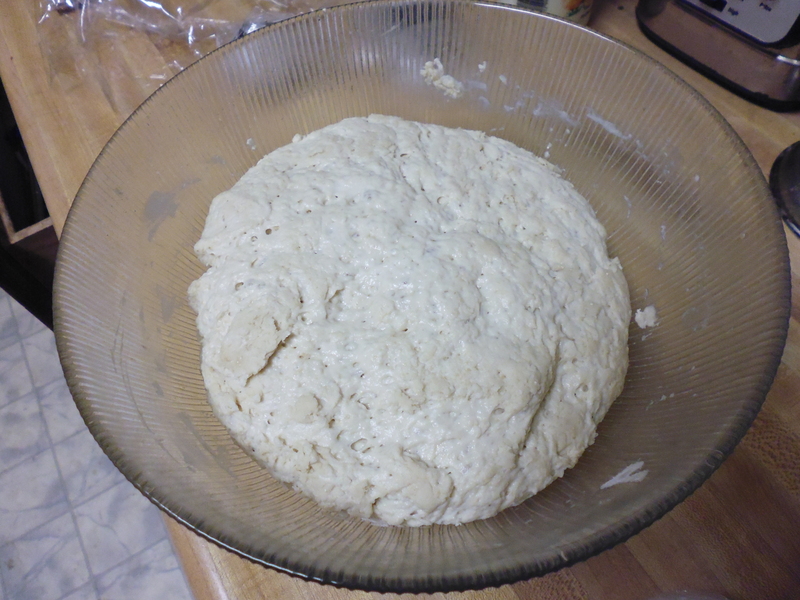 Pour in the yeast mixture, then the milk mixture, and stir to form a soft, sticky dough. 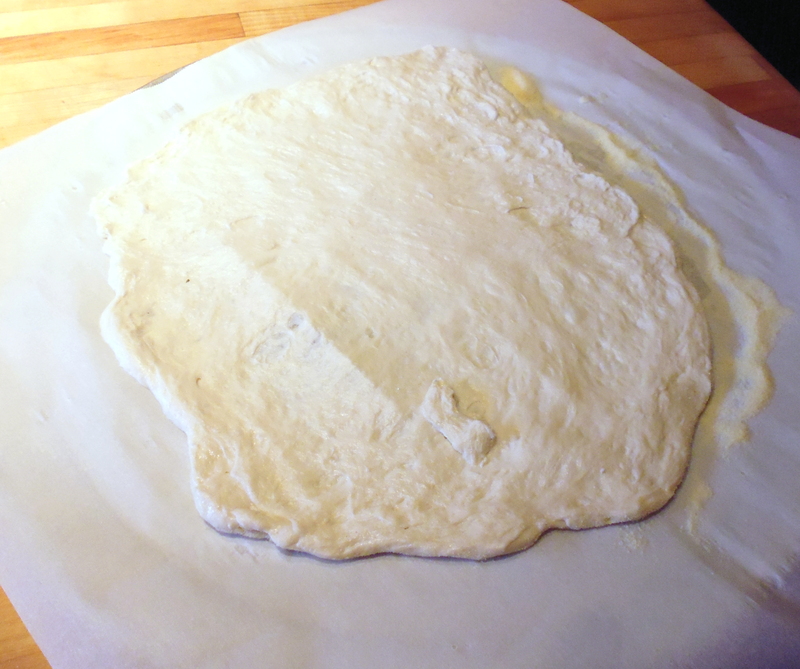 Scrape dough out onto a floured board and knead about ten minutes, adding flour as necessary. A dough scraper could be helpful here. Wash the bowl, dry it, and oil it with 2 tablespoons vegetable oil all over the inside. 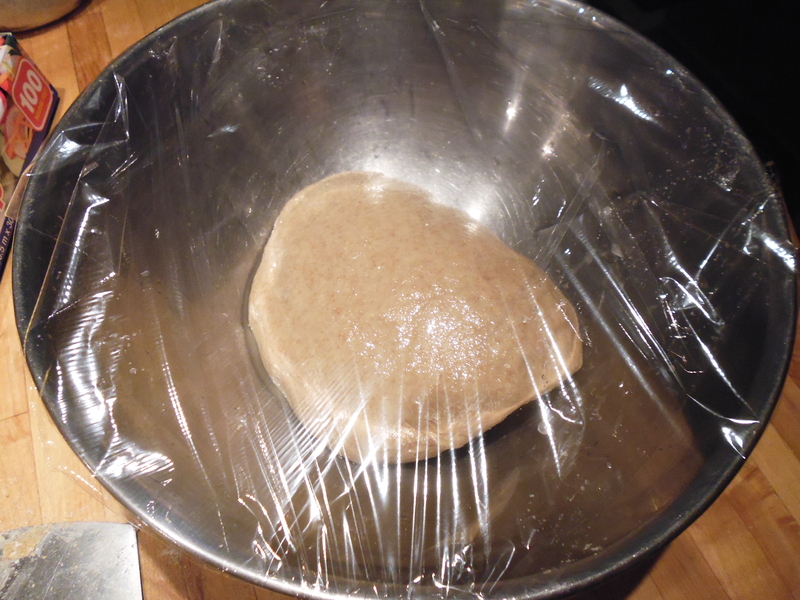 Plop the kneaded dough into the bowl, turn it over so it is coated with oil, and cover with a double layer of plastic wrap. Put the bowl in a warm-not-hot place for about an hour. It should be doubled. 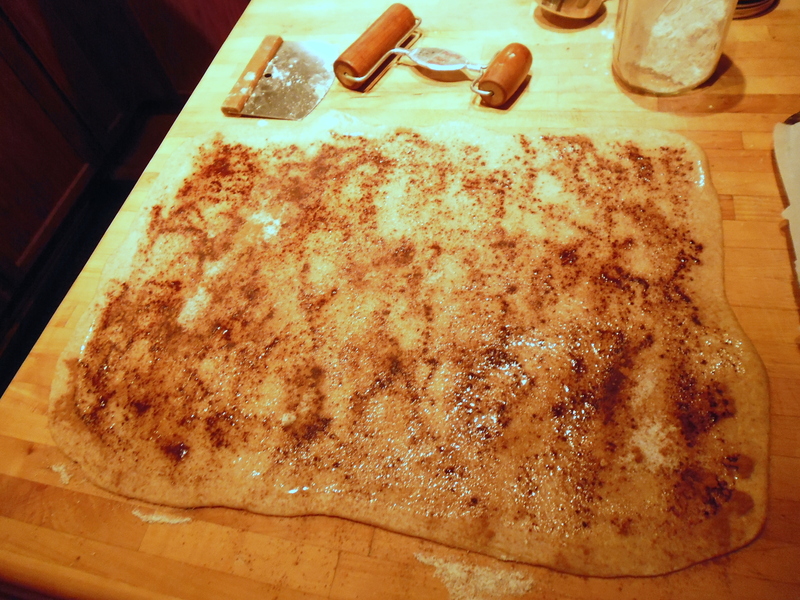 Punch the dough down and turn out onto a floured board. Roll it into a rectangle about 1/4″ thick. If it looks more like a map of Minnesota than a rectangle, that’s okay. Do the best you can. Melt 2 tablespoons butter and distribute over the rectangle. Then sprinkle with 1/3 to 1/2 cup sugar (depending on how sweet you like your cinnamon rolls) and about 1 1/2 to 2 teaspoons cinnamon. 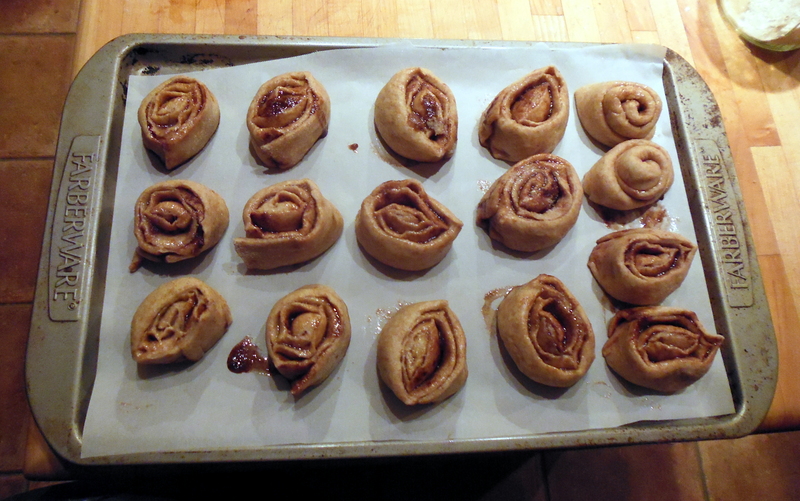 If you like raisins, nuts, dates, etc., feel free to add them before rolling the dough up. 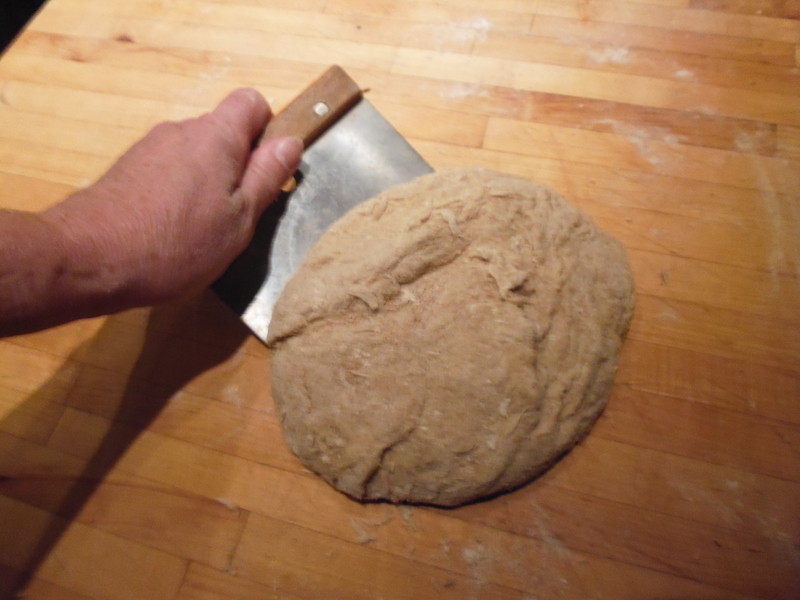 Now, starting from the side away from you, roll up the dough. You will need to work on one place, then another, rather than try to roll the whole thing up like a rug. 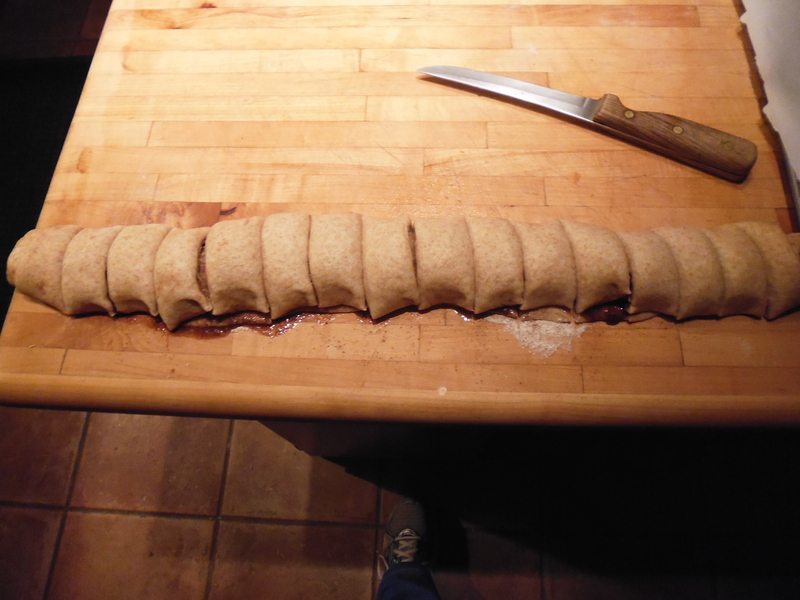 Using a sharp knife, cut the roll in half, then each half in half, and those halves in half again until you have cinnamon rolls. You can oil a cookie sheet, though I like to line the sheet with parchment paper (cleanup is easier). Carefully transfer the rolls to the cookie sheet. At this point you can cover them with a towel and let rise, or you can cover them with plastic wrap and a towel, and put them in the refrigerator to bake later. 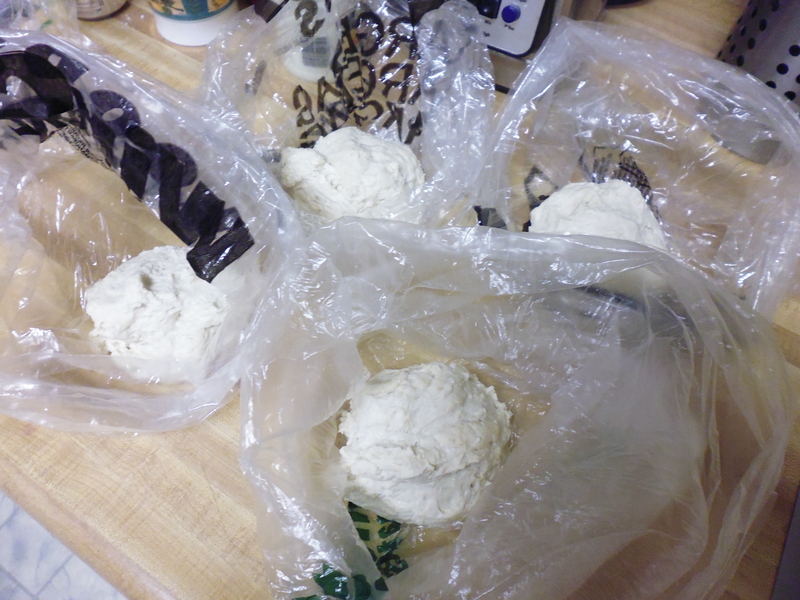 If you put them in the fridge, take them out about two hours before you want to bake them. Let them rise until puffy. Preheat oven to 325. Bake rolls about 20 to 25 minutes. Check the bottoms to make sure they don’t burn. Combine 2 cups powdered sugar, 3 tablespoons softened butter, 1 teaspoon vanilla extract, and 3 to 4 tablespoons milk to make a frosting. (It may look hopeless at first, but trust me, this will all work out – just keep mixing.) 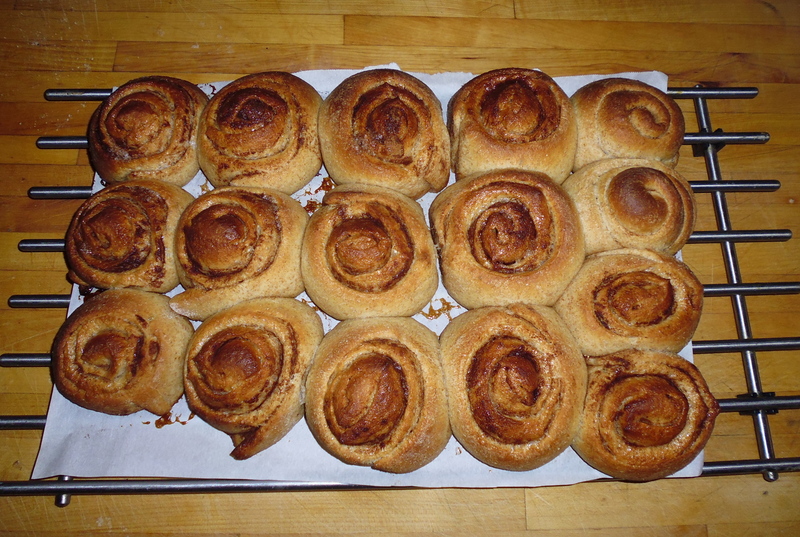 Frost rolls while they are still warm. Remove from cookie sheet. Eat right away or let cool and freeze. 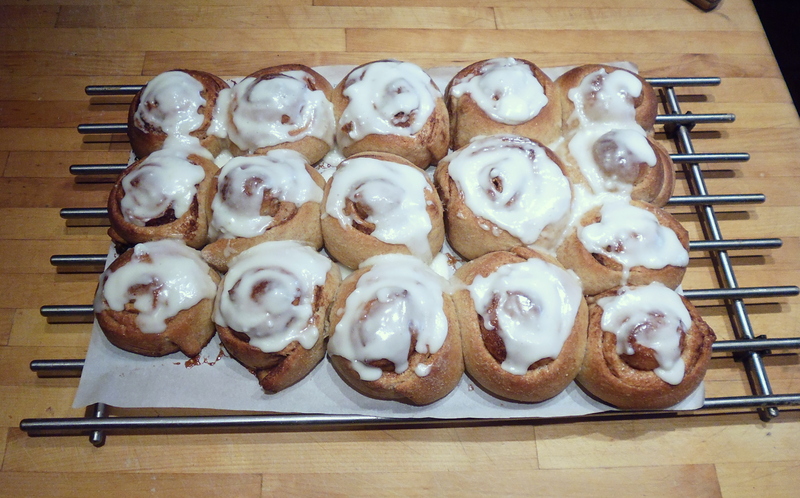 Posted in recipe and tagged baking, brunch, cinnamon rolls, dessert, vegetarian. Bookmark the permalink.